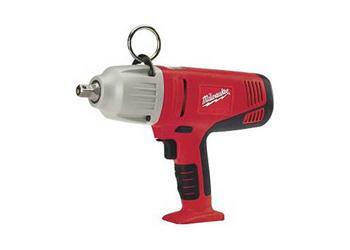 The Milwaukee 0779 28 Volt 1/2 in. Impact Wrench delivers 325 ft. lbs. of maximum torque. Powering the 0779 is the revolutionary 28 Volt LITHIUM-ION battery pack exclusively from Milwaukee. Combining high torque with 1,450 rpm and 2,450 ipm, the 0779 provides the power, speed and run-time to drive larger lags, drill bigger holes, and remove larger nuts. The powerful Milwaukee 28V motor makes breaking loose 'stuck' nuts a breeze. The heavy-duty magnesium mechanism housing provides extreme job-site durability. The 0779 comes equipped with comfortable non-slip, soft-grip surfaces that reduce vibration and fatigue. The forward/reverse shuttle is conveniently located above the variable speed switch for fast, easy access. Designed for heavy-duty use, whether driving large lag screws, anchors and bolts, drilling large holes, or removing lug nuts, the 0779 provides the power, comfort and run-time to finish the job. A heavy-duty steel ring (included) can be attached for convenient tethering when working high overhead or for raising/lowering the tool when working from a ladder or utility pole.